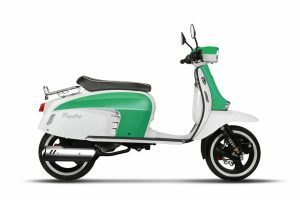 Representing the best value in the Royal Alloy scooter range is this, the GT 125i AC model. It weights in at a mere 130KG, due largely to its light weight plastic body. The Royal Alloy GT has the modern consumer in its sights. It’s for those looking for a easy ride with modern reliability and quality included of course.Under the side panels is a lively (and CBT friendly) 9.5 BHP, 2 valve SOHC engine which gives enough power for most city based users. There are plenty of colour options to choose from too. All journeys start somewhere and for Royal Alloy it is the GT 125i AC. At just 130KG the plastic bodied GT is aimed at the mainstream customer who appreciates a classic looking machine with modern Reliability and Quality. A punchy 9.5 BHP 2valve SOHC engine beats at the heart of the base model giving more than enough power for the majority of users, a generous 1390mm of wheel base combined with 110/70/12 & 120/70/12 profile tyres amply dampened front and rear by 4 shock absorbers, gives a sturdy, responsive feel that belies the value for money price tag.